John Ward, co-owner Ideal Pawn & Trading Company in Ponca City, shows Trooper Crompton in the store at 821 S Fourth Street accepting his new Milwaukee power tool kit. The other is picture of the jar full of donations. Ponca City pawn shop co-owner John Ward wants to express his appreciation to his customers who helped raise funds to help a new Oklahoma Highway Patrolman. Trooper Aaron Crompton received his own patrol unit in early October and found he needed a cordless 1/2-inch impact driver to help assist motorists with flat tires or other problems. Crompton was looking for a used driver since he was paying for it himself. Ward didn’t think it was right to ask Crompton to bear the cost alone and set up a donation jar to help offset the cost. State funds are not available for this type of tool, and Crompton had been using a four-way lug wrench, which takes even more time and could put him at greater danger. 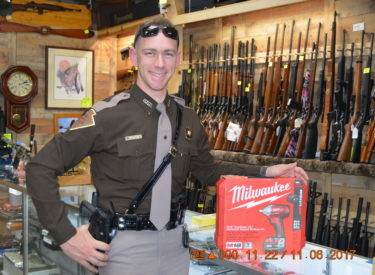 Ward set up a drive to earn the money to by the Trooper a new American-made impact wrench. “We put up a jar with the plea for help for the trooper, and within 10 days had sufficient funds to pay the $300 needed to buy the tool! Ponca City people are wonderfully generous. When one person in our store read the sign asking for funds, said to us ‘He gave me a ticket for $347….but I’ll pitch in $40,'” Ward said.